Guest post by Liana Semchuk. 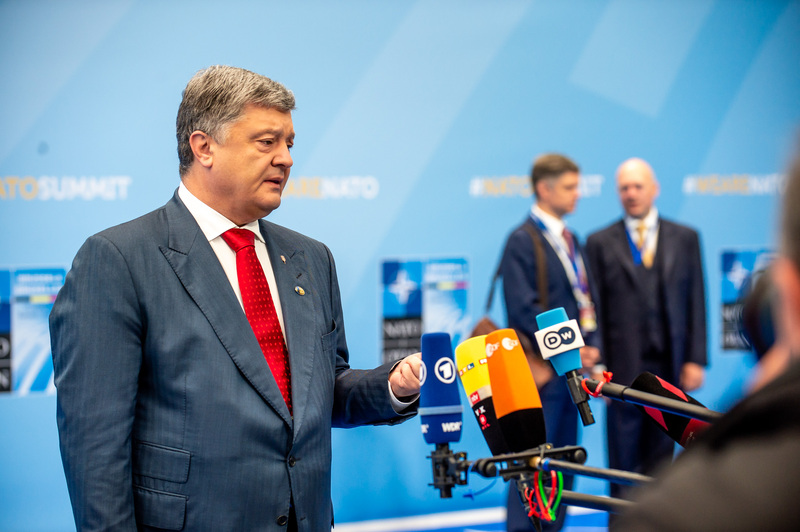 Current Ukrainian President Petro Poroshenko speaks to reporters at a NATO meeting in Brussels, July 12, 2018. Photo via NATO. Campaigning for the second round of Ukraine’s presidential elections—scheduled for April 21st—between Petro Poroshenko and Volodymyr Zelensky promises to be fierce. The good news, however, is that regardless of who wins, the transition of power is likely to be peaceful. Here’s why. Research shows that changes in executive leadership in countries without a long history of democracy—or countries with ongoing or recent violent conflict—exhibit a heightened risk of electoral violence. Ukraine’s recent experiences certainly make it an illustrative example of this relationship. For example, during the 2004 presidential elections, candidate Viktor Yushchenko was poisoned and the election rigged. These events ultimately sparked a mass protest known as the Orange Revolution. Then, a decade later, in 2014, at least one hundred protestors were shot dead in the Kyiv during the ouster of then-president Viktor Yanukovych. Instances like these demonstrate what politicians in Ukraine are capable of when they are desperate to win or cling to power. Electoral seasons, therefore, give voters and the international community cause for apprehension. Research on electoral violence points to a number of factors that can lead to an outbreak of conflict, including discrepancies over the certainty and credibility of vote totals, the closeness of a race, and the presence of nationalist extremists. Despite the violence that unfolded after the removal of the executive in 2014, Ukraine’s current elections offer a glimmer of hope that these potential pitfalls will be avoided. The first round of presidential elections on March 31st set a positive precedent for the second round. The pre-electoral phase was peaceful, and the election day was also remarkably free from unrest. More importantly, the electoral results of the first round were declared by the OSCE/ODIHR Election Observation Mission as free and competitive. Given the importance of certainty and credibility of electoral results for post-electoral stability, this is an encouraging sign for the weeks ahead. Second, the first round of voting shows a relatively large gap between the two candidates vote totals. According to the latest available data, Zelensky finished the first round with 30.44% of the vote—this is 14.23% more than his opponent and incumbent, Poroshenko, who finished with approximately 16.15% of the vote. Zelensky is predicted to continue leading well ahead of Poroshenko the second round according to the latest data. If the electoral gap remains sufficiently large, it is unlikely that Poroshenko will resort to undemocratic tactics in the second round in an effort to tip the scales in his favor. Third, electoral violence can result from the presence of radical or nationalist groups that could incite violence. 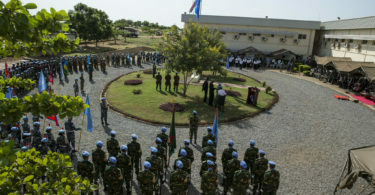 Elections, especially during a time of armed conflict, offer a receptive environment for nationalist groups to further divide the public along regional, linguistic, or ethnic lines. This threat, however, failed to materialize after the first round of elections—Radical Party’s Oleh Lyashko won only 5.19% of the vote and appears to have accepted defeat. As the presidential candidates head to a public debate in mid-April, observers should expect the campaigning to grow more heated in the last push before elections on April 21st. The transition of power, however, is likely to remain peaceful—major indicators suggest that both men will continue to abide by democratic rules, with the real battle playing out in the media and on the debate stage. Liana Semchuk is a PhD candidate at the University of Oxford, Nuffield College specializing in contemporary East European politics, and issues pertaining to oligarchs, money laundering, and institutional corruption.